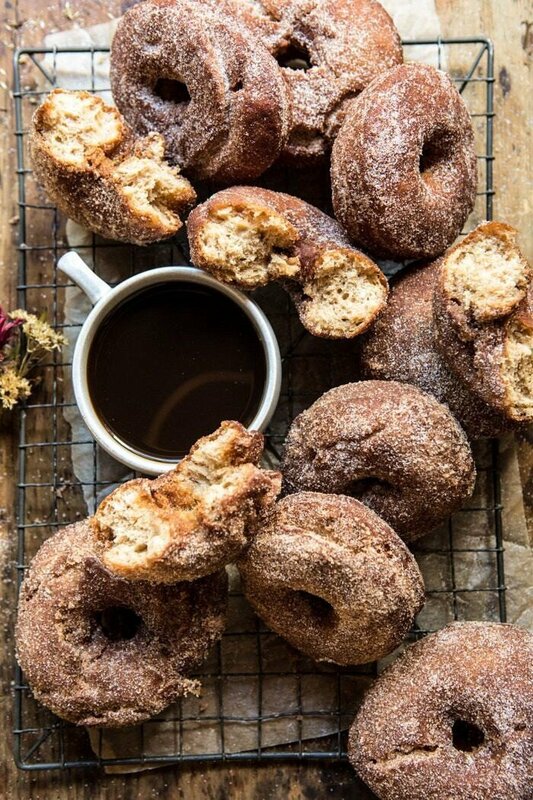 Mulled Spiced Apple Cider Doughnuts. 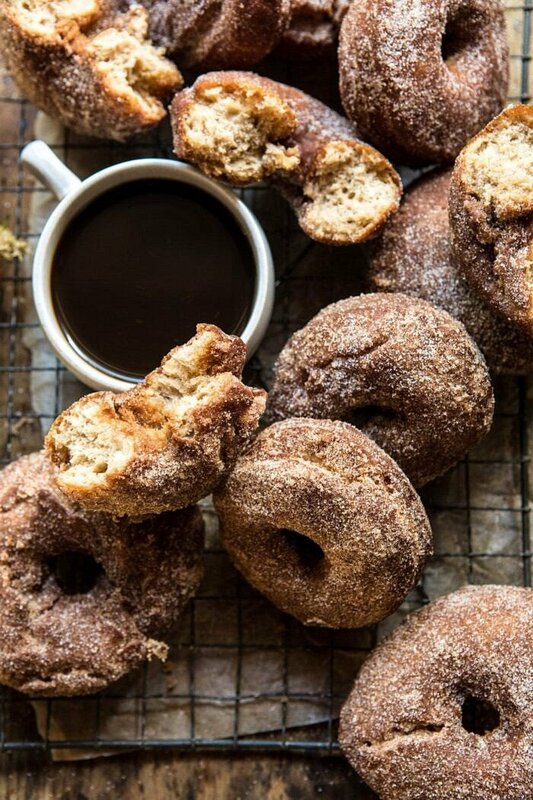 If there was ever a recipe that screams fall it’s these apple cider doughnuts. Homemade doughnuts made with mulled cider, cinnamon, apple butter, and maple. Fried to perfection (because if you’re going to eat a doughnut, eat a real doughnut), and rolled in cinnamon spice. There’s nothing not to love about these sweet doughnuts. Best enjoyed while still warm, with a steaming mug of coffee. The perfect way to welcome in fall this weekend. 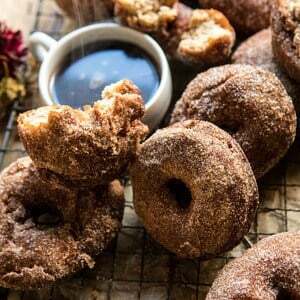 Tomorrow is the official start of fall, so today I just had to share one of the most fall-ish recipes I could think of, apple cider doughnuts. I know that I’ve been talking about fall for the last week non-stop, but you guys know it’s my favorite season, and I can’t help but be overly excited. I mean the blog is called Half Baked Harvest after all. Not going lie, I spent weeks brainstorming just what to share today. Nothing felt special enough, but then it occurred to me that I had not once made apple cider doughnuts. When I realized this I was up out of my desk chair and frying up doughnuts within minutes. Jumping right into details today, because I feel as though I’ve been rambling a lot this week. Plus, I’ve spent the last few days unpacking and organizing the studio barn, trying to get it to be actually “work ready” and I’m just slightly tired. We still have so much to do at the studio, but progress is being made! I’ll share more details in Sunday’s Favorites post. You know how there are some recipes that are just so delicious and so so crave worthy? Well, these doughnuts are just that. They’re full of fall flavors, crisp on the outside, soft on the inside, perfectly sweet, and truly mouth wateringly good. They’re best enjoyed on a crisp fall morning, or afternoon, with a warm mug of coffee, tea, or hot cocoa. To start, make the doughnut dough. Unlike most doughnuts, apple cider doughnuts are not made using any yeast, and instead are made with baking powder and baking soda. Not only does this make them simpler and easier to make, but it gives them a heartier, denser texture with a soft inside, but a slightly crisp outside. 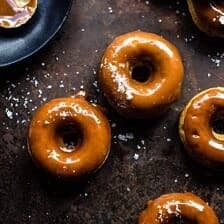 To make my doughnuts extra flavorful, I like to use homemade mulled apple cider, apple butter (truly my favorite autumn ingredient) autumn spices, and maple syrup. 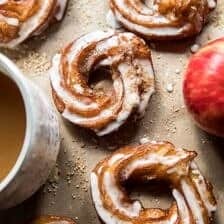 The combo of apple cider, apple butter, and maple make these doughnuts extra special, and extra delicious. And just slightly different from all the rest. The key to a really good apple cider doughnut though? Frying them and almost immediately rolling them generously in cinnamon spice (also known as cinnamon sugar). I’ll be the first to admit that I hate frying. 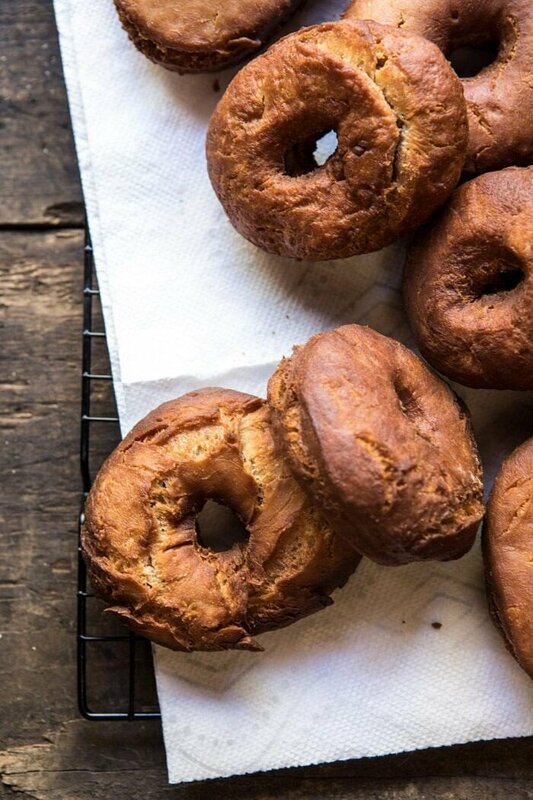 But sometimes, every now and again, like when fall rolls around and you have a rainy weekend on your hands, frying up apple cider doughnuts is the only thing you should be doing. Try making them this weekend. Promise you will not be disappointed. 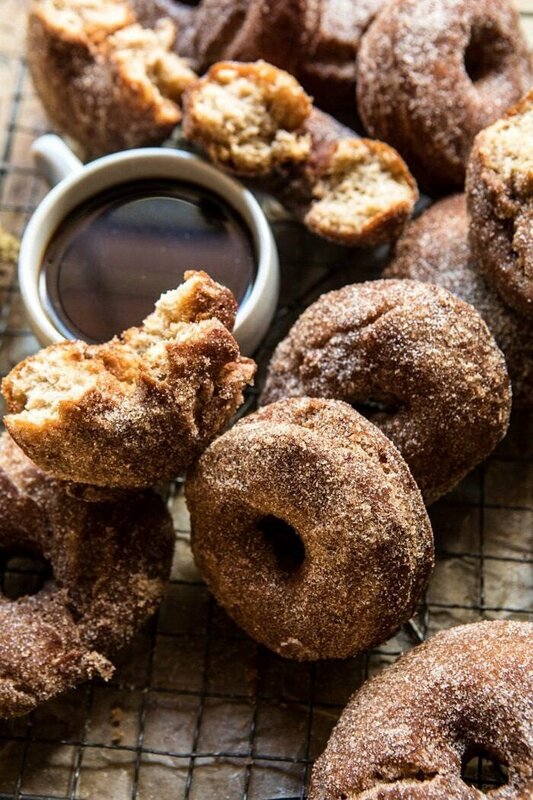 These are everything you want out of an apple cider doughnut, but better. Also? 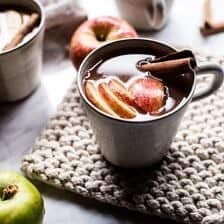 If you happen to go apple picking this weekend, or sometime in the near future, grab some good apple cider while you are out. Good cider makes all the difference. Also, also…these really are best when eaten slightly warm and with steaming coffee. Highly recommending making a batch for an afternoon snack…and maybe lighting a candle too, because if you’re doing the cozy vibe, do it well. Mulled Apple Cider Doughnuts from Half Baked Harvest on Vimeo. 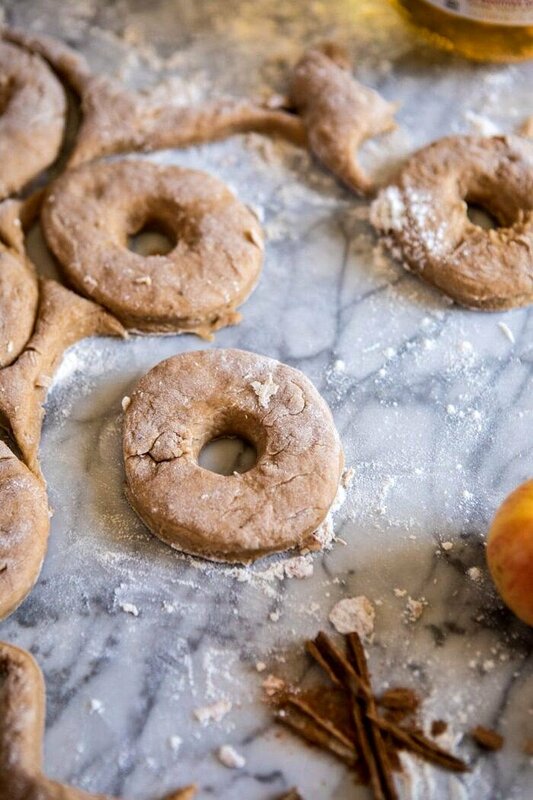 If you make these mulled spiced apple doughnuts, please be sure to leave a comment and/or give this recipe a rating! Above all, I love hearing from you guys and always do my best to respond to each and every comment. And of course, if you do make this recipe, don’t forget to also tag me on Instagram! Looking through the photos of recipes you all have made is my favorite! 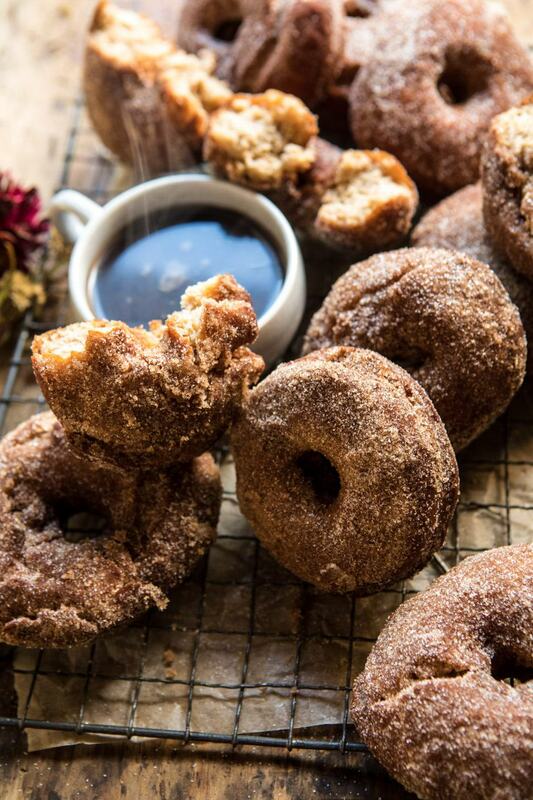 These apple cider doughnuts are the essence of fall. Homemade doughnuts made with mulled cider, cinnamon, apple butter, and maple. Fried to perfection, and rolled in cinnamon spice. The perfect way to welcome in the season! 1. Bring the apple cider and cinnamon to a boil over medium high heat. Reduce the heat and simmer 20 minutes or until reduced to about 2/3 to 1 cup. Remove from the heat. Let cool 5-10 minutes. Remove the cinnamon stick and discard. Add the cider to a large mixing bowl. 2. To the cider, add the butter, maple syrup, apple butter, vanilla, and eggs. Beat to combine. Add the flour, baking powder, baking soda, salt, 1 teaspoon cinnamon, and nutmeg. Using the dough hook, knead the dough until a smooth ball forms, adding 1/4 cup additional flour, if needed to bring the dough together. Cover the bowl and let rest 15 minutes. 3. Meanwhile, in a shallow bowl, combine the sugar and 1 tablespoon cinnamon. 4. Heat 2 inches of oil to 350 degrees F.
5. Lightly flour a work surface and roll out the dough to a 1/2-inch thickness. Using doughnut or cookie cutters, cut out rounds of dough. 6. Working in batches, use a slotted metal spoon or spatula to carefully place the doughnuts into the hot oil. Fry, flipping once, until light golden brown and puffed, 1 to 2 minutes per side. Drain onto a paper towel lined plate. 7. Coat the warm doughnuts in cinnamon sugar...generously. These are best eaten slightly warm, so enjoy! Hi! I would love to make this recipe this weekend, but wanted to double check the cider reduction. Is it reduced from 3 cups of cider to 2/3 cup of cider (over 2 cups less seems like a lot of reducing!) or is it by 2/3 of a cup? I was just introduced to your blog by my brother who is married to your moms roommate in college. I love it all. I love food, cooking, gardens, the mountains, your barn… your whole everything. So impressed. I love that! I am so glad you and your daughter love to make my recipes and hope you continue to! Thank you! I’ve got a rainy weekend and a cop husband. Looks like I know how I’m going to be spending my day! I think His department will love these! That is so sweet of you to make these for them! I hope they all love them and you do as well! Thank you! Omg this brings back the best memories of growing up in northern NJ!! It wasn’t truly fall until the apple cider donuts were available, and boy did we look forward to them every year! I’m so excited you posted a such a fabulous sounding recipe for them, because now I can make them instead of ordering them lol!! I hope you love these just as much Diana! Thank you! OMG these were delicious! I made these yesterday and had a few issues while making but they still turned out amazing! When I was reducing the apple cider it took probably 30min to an hour to reduce to 1 cup- maybe it’s the brand I used. I used all of the 1 cup reduced cider which was probably my next mistake. I had to add over 1 cup more flour to get the dough to come together. I hope to try these again soon and see if reducing to 2/3 cup helps make them a little less sticky and use less flour. 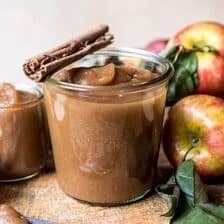 I also want to make your homemade apple butter! Thank you so much Emily! I am so glad you loved these! Also, I hope you love the apple butter! These look great! Do you think I could bake these using the same recipe? 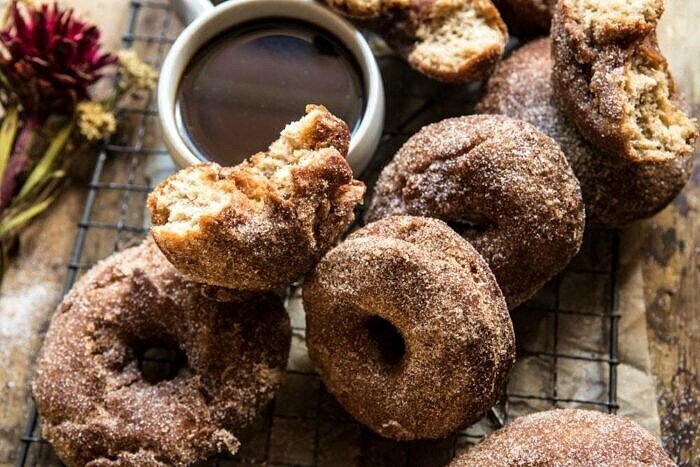 Apple cider doughnuts are the best, these look perfect! Hi Tieghan! I love your blog and your beautiful cookbook! I’m wondering if you can recommend a donut pan? Silicon? Wilton? I can’t wait to try these! Sounds so fun! Any suggestions on trying to make these gluten free? I love this recipe! I would have never thought of that! PS: I LOVE your recipes! @Erika, and others – I am in the midst of making these right now. I echo the sentiments already expressed. It took much longer than 10 minutes to reduce at a safe simmer; I added an additional cup of flour beyond what was called for, but I stopped mixing for fear of over-working the dough. It is currently resting. I am hoping they turn out as well as others say they did. I use HBH for recipes probably once a week. I love everything I’ve ever made from this site. However, I’ve had to adjust and tweak nearly everything I’ve ever made. Normally, it comes down to a matter of time – the steps never take as long (or as little time) that the recipe suggests they will. I had the passing thought today that it could have to do with the difference in altitude? Is it possible that is affecting such things as the times and (sometimes) the amounts, and that it isn’t always accounted for? I don’t know enough about these things to say for sure, so it is just a passing thought. I will continue to use this site and cookbook because everything off of it is delicious, but I always do so with a bit of caution. What size (diameter) cutters did you use to cut out the doughnuts? These look so good! Hi, a little nervous to try these because of all the reviews that mention them not working but they look too beautiful not to try! That being said, I can’t seem to find apple butter – is there anything I can substitute for this ingredients? Thank you!